Cebu is located in the Visayas region of the Philippines, and its capital Cebu City is the oldest city in the country. It is a main center of commerce, trade, education and industry. Steeped in rich culture and history (especially under Spanish colonial rule after the arrival of Ferdinand Magellan), Cebu offers a plethora of sights and experiences for locals and tourists alike. Check out our list of the best things to do, the best food to eat, and the best places to stay in Cebu! 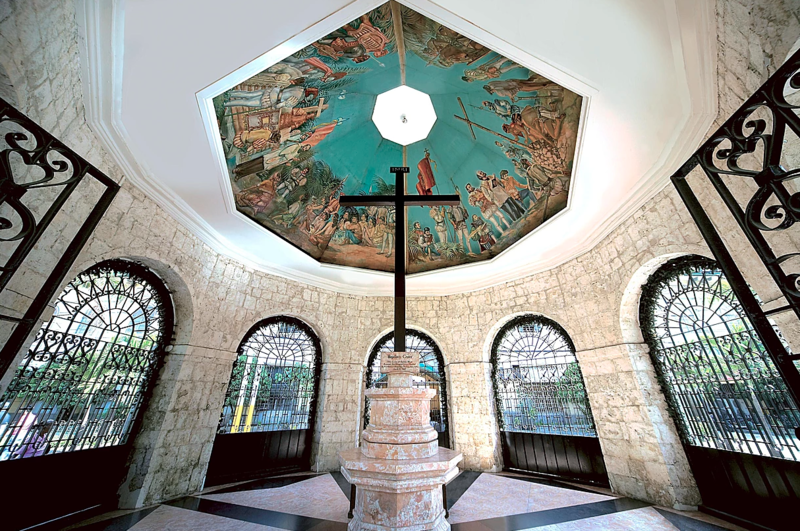 Ferdinand Magellan ordered for this ancient Christian cross to be planted by Portuguese and Spanish explorers upon his arrival in Cebu, Philippines on March 1521. The cross is nestled in a chapel right next to the oldest Roman Catholic church in the country, the Basilica Minore del Santo Nino de Cebu – commonly known as the Santo Nino Basilica. In for a thrill? Come UP to the Sky Experience Adventure located on top of the Crown Regency Hotel in Cebu. You have a variety of rides to choose from, that will help all your adrenaline needs. The Edge Coaster is on the edge of the building’s 38th floor. You’ll be strapped onto a two-seater platform which is tilted up to about 55 degrees that gives you an aerial view of Metro Cebu and nearby islands 426 ft above ground! The Sky Walk Extreme tour allows you to walk around the transparent glass floors located on the edge of the hotel’s 37th floor with the Sky Walk Extreme tour. The Tower Zip is the country’s first and only urban zip-line. 500ft in the air, above ground it’s the highest you can go in this rooftop theme park — zip lining across two of the hotel’s towers. A traditional open-air fish market in the Philippines, Taboan has been featured on Anthony Bourdain’s No Reservations. The main thing visitors come here to purchase is the danggit, which is dried salted fish that you can then fry, serve with rice and vinegar. If you’re not down with the stank, you can also find a variety of other pasalubong items, like otap, chicharon and my fave dried mangoes! It’s no rumor — the BEST LECHON is located in Cebu! You’ve guess it, even world renowned chef, Anthony Bourdain has named it “The Best Pig Ever”. Do I have to say anymore? Just come to Cebu’s Zubuchon and find out for yourself! A BBQ haven and a popular spot amongst locals, Larsian is open 24 hours and incredibly affordable. You will find no spoon or fork, instead you’re given disposable plastic gloves to use. If you haven’t used your hands before, now’s your chance to learn! Try the Chorizo de Cebu and you’ll probably mistake where you are for heaven. Easily accessible in SM City Cebu, Lamesa offers traditional Filipino foods in a modern Filipino ambience. Although their menu is filled with classic Filipino dishes, Lamesa finds a way to add new and exciting flavors in every bite. Watch Garrett and Miristi try food from Lamesa here. Though there may be no breakfast buffet here, there’s free WIFI, and a comfy bed for you to sleep on for an affordable price. Modeled after the Japanese concept of no-fuss, no-frills accommodations, Islands Stay is contemporary, clean, and affordable for the modern traveler. Offering slightly different experiences, The Shangri-La Mactan in Cebu has two central parts, the Main and Ocean Wing. Though the rooms in the Main Wing are no doubt beautiful, the Ocean Wing provides a more private experience. Their breakfast buffet includes Filipino, American, and even Korean breakfast options. Tucked away on the Mactan Island in Cebu, Costabella is a blissful holiday beach resort that is inviting, quaint, and serene with direct sea access. Explore the white sandy beaches and warm ocean waters. It’s family-managed with delicious food, cozy rooms, and good old fashioned hospitality. Do you have any suggestions for what to do, where to eat, or where to sleep? Let us know in the comments below! pasalubong (n.) – the Filipino tradition of bringing a homecoming gift or souvenir after travelling; as a rule of thumb, the best pasalubong is always food.